Awesome! Wow! Fun! 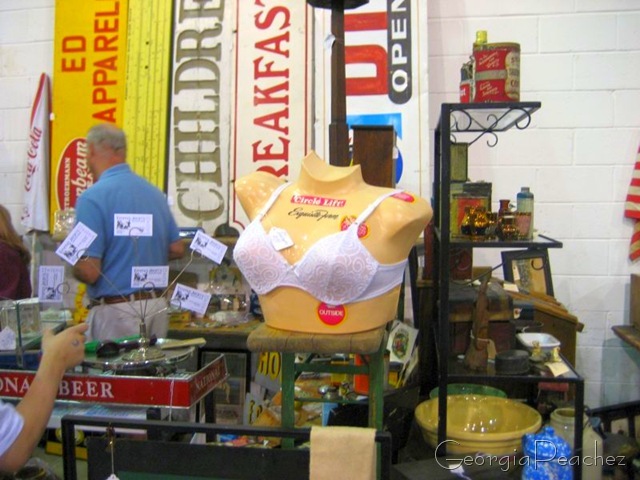 That was the Big Flea in Chantilly, Virginia this weekend. 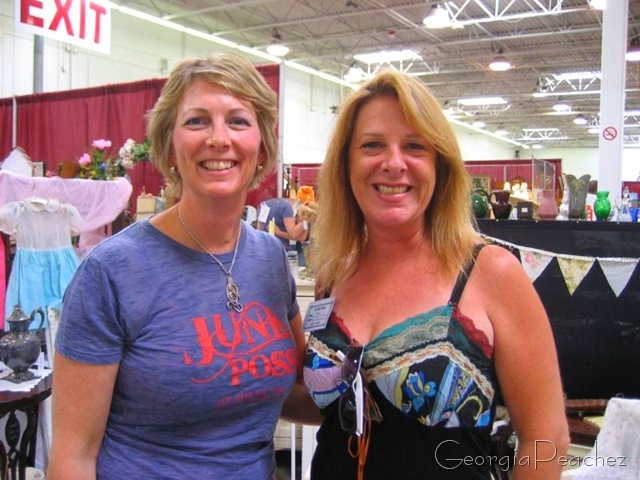 Over 600 vendors in two buildings. I drove up from Hampton on Friday to visit with Beth and our grand plan was to attend the Washington, DC area BIG FLEA on Saturday. We were there right when it opened and we made a mad dash to the booth of Truffle Pigs, our absolute fav! I found some wonderful things in that booth and so did Beth. Just look at that expression! 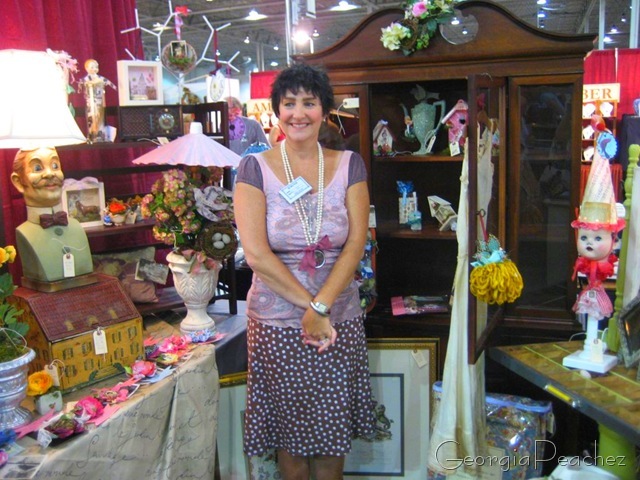 Beth is so excited about all the fabulous vintage sewing items and beautiful creations that this booth is stuffed with. This was an especially good Big Flea, lots of textiles, buttons, trims, vintage christmas and jewelry. All the things that we were searching for. Lots of other interesting items too. Bullet bra anyone? I thought this daisy painted lunch box was so sweet! 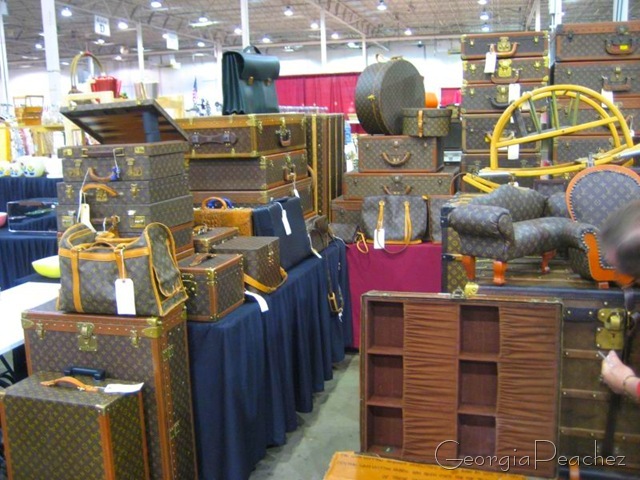 I hadn’t seen this vendor at the Big Flea before, stacks and stacks of vintage LV. I took this picture for my sister, she will love this! See the train case on the table on the corner. $1900, oh yeah. 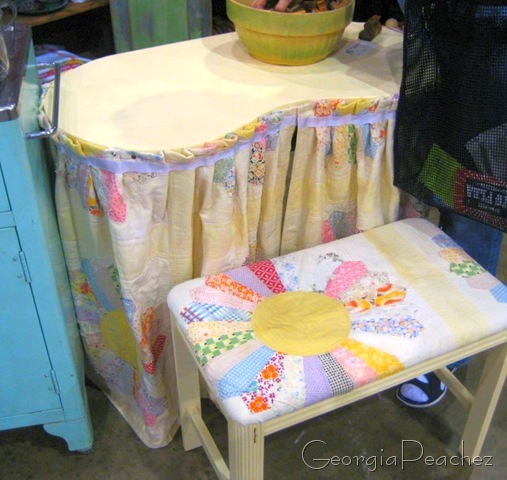 What a great use for a vintage quilt! 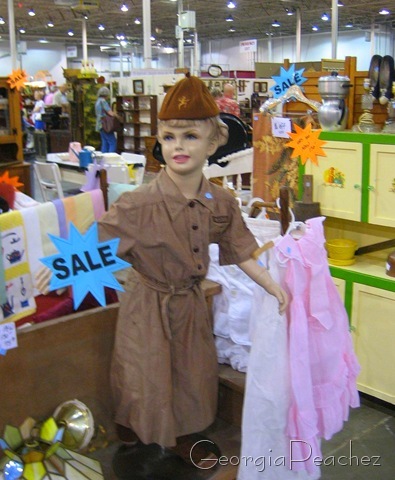 We have many friends that sell at the Big Flea. This is Beth’s friend Stephanie. She had a fabulous booth filled with her collage creations. Very nice!! 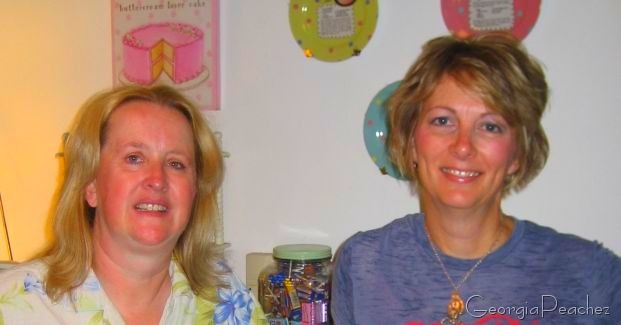 Here I am with Sue of Vintage Rescue Squad. We met through our blogs and this was our first time meeting up in person. 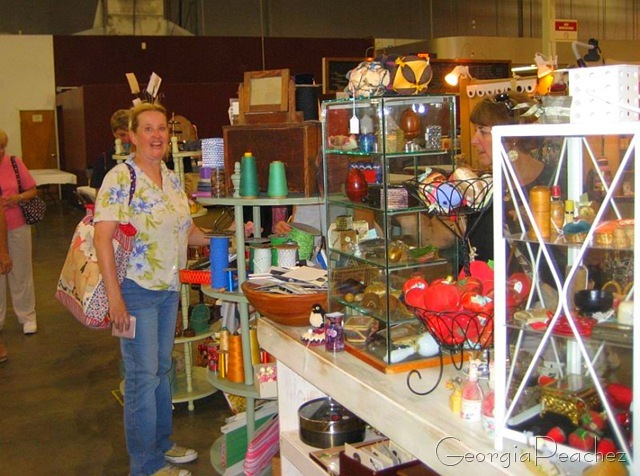 Sue had a great booth too filled with her treasures collecting at yard and estate sales, or junking and thrifting. I had to leave immediately following the Big Flea and head home to Hampton. Out of town guests were awaiting my return and today we are busy showing them around town. Everyone is taking a quick nap to recover before dinner so I grabbed a minute to share these pictures. As soon as I can I will photograph the wonderful treasures that I brought home and share them. 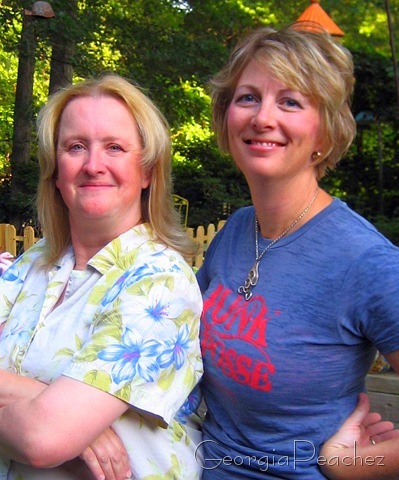 Last but not least here is a great picture of Beth and I taken early morning before heading out to shop. We had a great time. Shopping for treasures is always fun, but it is really special when it’s time spent with someone near and dear. That looks sooo fun! You lucky girls! Can’t wait to see what you managed to find!! 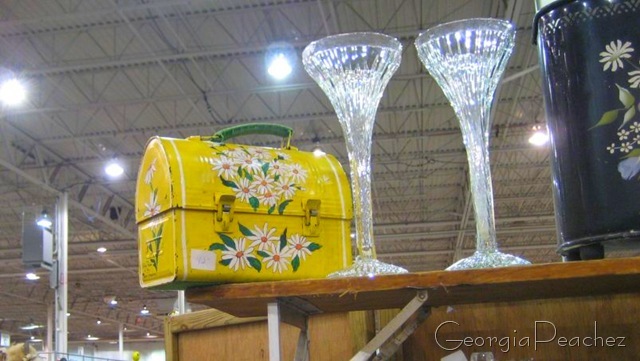 That painted lunch box is divine! Did you get it?! Hi Suzy, wow so envious, you look like you had an absolute ball!! Can’t wait to see youe treasures! Thanks so much for my gorgeous bag which arrived last week…so cute, i haven’t used it yet but am enjoying just looking at it hanging in my ‘studio’ for now. Kiss noises Linda Lilly Cottage. Lucky ladies! Looks like you both had a great time! Thanks for sharing your photos! Oh how fun! Looked like a great day! Thanks for sharing! No, I don’t want that bra. And I wish that they’d never invented the damned things to start with! So uncomfortable. Like wearing armor in this horrendous heat! Sounds like you guys had a fab time. Enjoy your company! Glad to see the Big Flea is still going strong in Chantilly. I have fond memories of attending it when it used to come to the Hampton Coliseum and the Richmond Fairgrounds many years ago. All of those Vuitton luggage is real??? Will love just to see them together, even if I can not buy a single one!